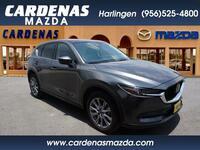 Anyone looking to purchase a new crossover SUV is going to want to make their way on over to Cardenas Mazda in Harlingen, TX. That’s because we’re proud to announce the arrival of the new 2019 Mazda CX-5 lineup – which, thanks to a slew of updates and upgrades, has cemented itself at the head of the crossover SUV class. Speaking of enhancements and improvements made to the new 2019 Mazda CX-5 lineup, the lineup has welcomed an all-new, top-of-the-line trim level to its family in the form of the 2019 Mazda CX-5 Signature. With a luxuriously high-quality interior, a sleekly and stylishly refined exterior, and a comprehensive suite of advanced new safety, driver assistance, technology, connectivity and comfort features, this all-new trim level gives the 2019 Mazda CX-5 lineup a luxurious new model to offer customers. Now that the Signature trim level has joined the lineup, the 2019 Mazda CX-5 lineup features five trim levels to choose from – the 2019 Mazda CX-5 Sport, the 2019 Mazda CX-5 Touring, the 2019 Mazda CX-5 Grand Touring, the 2019 Mazda CX-5 Grand Touring Reserve, and the aforementioned 2019 Mazda CX-5 Signature. The first three trim levels – the 2019 Mazda CX-5 Sport, Touring and Grand Touring – feature the same standard engine: a 2.5-liter four-cylinder DOHC SKYACTIV®-G engine that itself features Cylinder Deactivation capabilities. The maximum power ratings for this engine are 187 horsepower and 186 pound-feet of torque. The other two trim levels – the 2019 Mazda CX-5 Grand Touring Reserve and Signature – feature a 2.5-liter four-cylinder VVT Dynamic Pressure Turbo SKYACTIV®-G engine as their standard engine. The maximum power ratings for this engine are 250 horsepower and 310 pound-feet of torque. Inside, the 2019 Mazda CX-5 lineup boasts a roomy 103.6 cubic-feet of total passenger space, to go along with 30.9 cubic-feet of cargo volume when all of your seats are in place, and 59.6 cubic-feet of cargo volume when your rear row of seats is folded flat. To learn more about the 2019 Mazda CX-5 and everything that comes with it, please get in touch with our staff here at Cardenas Mazda in Harlingen, TX.